AVALON INSTRUMENTS accessories: Furhter accessories can be found in our AVALON price list (only in german), this will also be listed bit by bit. Contact us and we will gladly create an individual offer for your desired device. 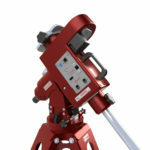 The M-Uno Dual Fast Reverse mount is a single arm equatorial mount designed for astronomical imaging. Coming with the same RA mechanics and Fast Reverse, Belt driven System, is an upgraded version of the well known M-Uno mount. The innovation on the M-Uno Dual mount is the new fully rotating Declination axis, which allows the use a second clamp (optional) to hold a second smaller OTA or X-Guider (optional). Either a standard or adjustable version of the GP & Losm. 3” clamps can be easily attached to the declination axis. Both the adjustable clamps are provided with inox screws to align a second scope (of smaller size compared to the main one used) in order to have both perfectly aligned to the same object or field of view. As an alternative, also the X-Guider accessory can be attached directly to the declination axis end as it provides a fine alignment of the guide scope itself. The use of a second scope on the new M-Uno Dual will mostly avoid the use of any counterweight ! 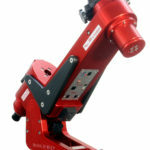 It is a very unique product in its sector, with a payload of 20-25 kg with counterweight (by use of a sesond scope max. 20kg on each side), both for visual and photographic applications. The M-Uno Fast Reverse project is the technological answer to the need of a mount able to definitely solve the frustrating meridian flip issue during long exposure imaging, typical with traditional equatorial mounts: when the scope crosses the meridian, the operator is forced to stop imaging and flip the mount, loosing precious time just around the best position for the object to be imaged (the meridian). Furthermore, after more than fifteen (15) years of experience on the field and after spending countless hours under the stars, imaging with many different telescopes, the project had the additional goal to eliminate a number of troubles and limitations found on traditional mounts, obtaining a product optimized for SC and rear focus optics, with not too long OTA length. The M-Uno allows very long observing/imaging sessions, without any stop across the meridian. Very sturdy and lightweight fro easy transportation. A handle installed on the body of the mount. No cables around: all the cables connecting the motors to the electronics are inside the mount, so they do not interfere with the hand control unit cables. AvaLon M-Uno Mount now with new StarGO GoTo Control System (WiFi or Bluetooth version). More about the AVALON StarGo GoTo Control System. Ergonomic Knobs for fine tuning both the altitude and the azimuth of the polar axis. The altitude worm is not under the weight of the mount - in contrast with many competing mounts - so it is smooth and very accurate. Quick and robust counterweight shaft clamping, making easy the mount assembly. Both axes use high quality bearings, for a very fluid motion, with no friction even with heavy payloads, allowing a perfect balance of the mount. Very short damping time. Mount easy to balance. Thanks to the very small friction on both RA and DEC. axes, reaching a perfect, very accurate balance is amazingly easy. Adjustable fork to host tubes of different dimensions. Light and very sturdy: the head of the mount weights 15 kg (without counterweights and their shaft) and it can hosts a 200-280mm catadioptric, or a 110-130mm, short focal length refractor. In short, the M-uno FAST REVERSE mount is ideal for those travelling astroimagers seeking for long deep sky exposures, even with high focal lengths, without the troubles of meridian crossing with an excellent value for money. Obviously the particular characteristics of the M-uno make it ideal even for use in a permanent location, especially with remote control. Detailed information about the revolutionary technology and AVALON Mounts are available here. Alessandro Falesiedi: Why Avalon? Why M-Uno? Test Review by Derek Santiago on "www.cloudynights.com"